There’s nothing the comics industry likes so much as licensed material. Why go to the trouble of coming up with your own ideas when there are so many established ones just begging to be displayed in some sort of visual sequence? The very first comic books, after all, were just a collection of repackaged newspaper comic strips. 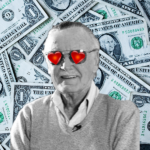 The love for licensing is even stronger now that pop culture nostalgia has proven to be a ginormous money maker (see just about anything playing at your local cinema). Take a trip to the comics store and you’ll find scores of titles based off such properties as Jem and the Holograms, My Little Pony, Ghostbusters, Voltron, Power Rangers, Fraggle Rock, Robocop, and so much, much more. Sometimes these comics are straight up garbage. Sometimes they are solid if uninspired adaptations that serve their purpose in evoking ever so slightly that je ne sais quoi that made fans cherish the source material. Occasionally (emphasis on “occasionally”) you get a cartoonist who offers a really interesting, delightful or spirited take on a familiar property (e.g. Carl Barks’ Donald Duck and John Stanley’s Little Lulu). 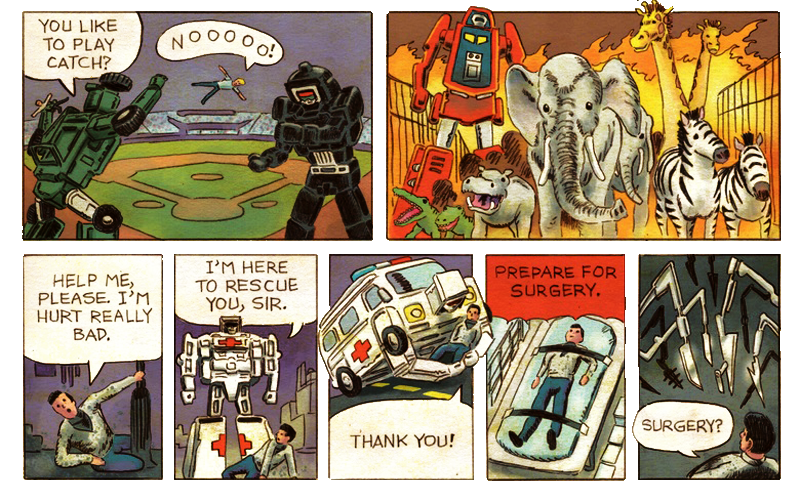 The latter is thankfully the case with Pittsburgh-area cartoonist Tom Scioli’s Go-Bots. If you’re a gen-Xer like me, you might remember the GoBots, an also-ran to the much more successful Transformers line. Even, then, though, you might be a bit hard-pressed to recollect the toy line. Scioli came to the fore around 1999 with the fantasy series Myth of 8-Opus, an homage to the grandiose fantasy sagas Jack Kirby created in the 1970s and ’80s. His next big project was Godland (written by Joe Casey), a tongue-in-cheek homage to the sorts of psychedelic epics folks like Jim Starlin published for Marvel in the ’70s. More recently, he tackled a similar licensed venture with IDW’s heady Transformers Vs. G.I. Joe (with John Barber), an anything-goes, frenzied affair that wasn’t afraid to get a little goofy every now and then. It cannot be over-emphasized how strong an influence Kirby’s work has been on Scioli. 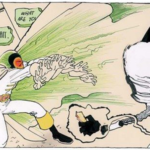 Kirby’s forced perspectives, blocky figures, extensive use of foreshortening and tendency towards bombast, can all be found in Scioli’s comics. As a result, Scioli has received criticism about being too retro, or perhaps rather too slavish, in his attempts to evoke his hero’s magic. I tend, however, to hold the view that he’s actually trying to see how far he can push this specific, idiosyncratic style before it breaks. How clipped can the dialogue be? 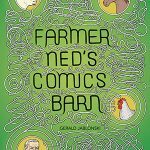 How dense can you make your panels and layouts? What story beats do you focus on and why? As freewheeling as Transformers vs. G.I. Joe was, Scioli and Barber did have to keep in mind a certain amount of fan expectations and decades of back story given that he was pairing two well-loved series. Since the Go-Bots franchise is relatively unknown (remember the Rock Lords? Of course you don’t) he has a lot more room to play. 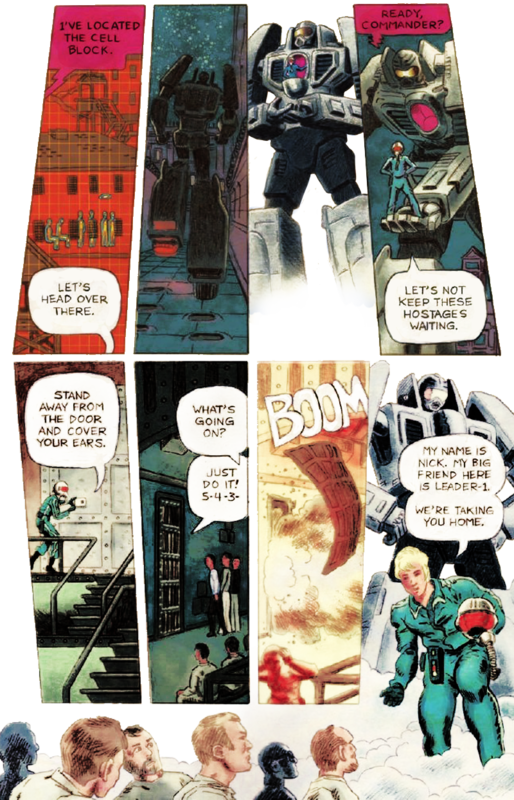 Indeed, as other critics have noted, play seems to be an integral part of Scioli’s comics, to the point where Go-Bots feels at times like it was created by a child sprawled out with their toys on the living room floor, making up the story as they go along. Scioli opens the series with a recognizable modern world, albeit one filled with sentient transforming robots that work as our servants — getting us to class, winning big sporting events and even battling rogue nations. Of course, it’s only a matter of time before some of these gigantic automatons decide they’d be better off running things themselves and a mechanical revolution of sorts sets in. And from there, things get really weird. One of the most interesting things about Go-Bots is its pacing. Scioli isn’t interested too much in introspection or slow builds or even connecting sequences. That’s just stuff that gets in the way of the fun. What we get instead quickly cuts from one visual high point to another — point-of-action to action-to-action — along with the occasional expository text or weird aside. There’s no lingering. Now the Go-Bots are attacking people! Now they’re fighting each other! Now we’re hundreds of years in the future! Now we’re underground being attacked by giant bugs! To this end, Scioli crams his page with small vertical panels, often with a character breathlessly explaining their alliance, emotion or status. This is a very dense comic. As you might guess from this breakneck pace and whiplash plot developments, Scioli isn’t taking things too seriously. While he clearly wants you to be invested in the story and the overarching themes about the dangers of an overreliance on technology (“Put down your phone” a character demands of another at the very end, while looking directly at the reader), sly visual gags abound, from references to other toys (the Go-Bots security system is a version of Simon) to allusions to classic comics and more. Scioli knows full well that while giant battling robots can instill a sense of fun and awe, they merit a number of chuckles as well. It’s easy to look at a cover of a Go-Bots comic, with its giant robots staring down at you dramatically and disdainfully regard it as little more than a cynical marketing ploy, designed solely to cash in on nostalgia. After all, an artistic expression rarely coincides with this sort of enterprise. Images edited by Barbara Chernyavsky.